If you want a flavor profile that is distinctly New Mexican, there is nothing more New Mexican than green chile! 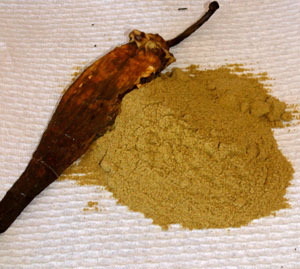 Our dried green chili powder is made from authentic New Mexico green chiles which can complement any Southwestern dish. Used as a rub, in soups, or as a seasoning, green chile imparts a sweet, roasted quality which enhances your gastronomic experience with a mild heat. The Chile Guy‘s dried green chile powder will give your recipe a distinctive New Mexico flavor. Whether you are concocting Chile Verde, Green Chile Stew, festive Enchiladas, or just plain chicken soup our green chile can lend a unique culinary flair to your creation! Chile powder is often a more economical method for infusing your foods with green chile flavor without the need for storing large amounts of fresh, frozen or dried green chile. With our dried green chile powder you get a pure, natural, 100% chile powder to incorporate into your commercial application! Call 800.869.9218 to get Grade A dried green chili/chile powder from The Chile Guy today!